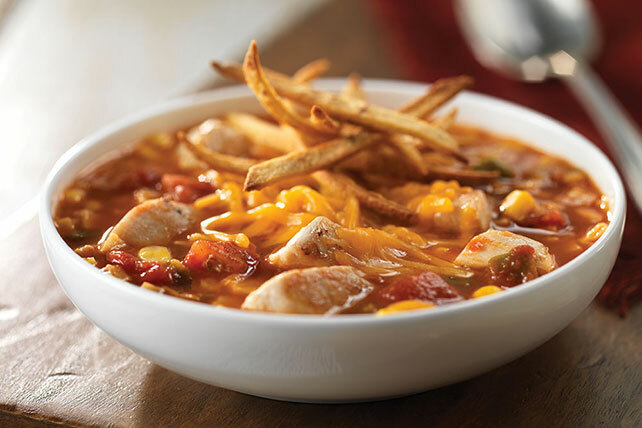 Enjoy this Chicken Tortilla Soup, a Southwestern cousin of Mom’s chicken soup. Like its popular relative, it’ll make you feel good all over. Chicken Tortilla Soup Enjoy this Chicken Tortilla Soup, a Southwestern cousin of Mom's chicken soup. Like its popular relative, it'll make you feel good all over. Cut 2 tortillas into strips; toss with ½ tsp. oil. Spread in single layer on baking sheet. Bake 10 to 12 min. or until crisp, stirring occasionally. Meanwhile, finely chop remaining tortillas. Heat remaining oil in large saucepan on medium-high heat. Add chicken; cook and stir 5 min. Add chopped tortillas, broth, salsa and corn. Bring to boil; simmer on medium-low heat 15 min. Serve topped with cheese and tortilla strips.